Since its initial publication, Teachers Have It Easy has attracted the attention of teachers nationwide, appearing on the New York Times extended bestseller list, C-SPAN, and NPR’s Marketplace, in addition to receiving strong reviews nationwide. Many teachers today must work two or more jobs to survive; they cannot afford to buy homes or raise families. Interweaving teachers’ voices from across the country with hard-hitting facts and figures, this book is a clear-eyed view of the harsh realities of public school teaching, without chicken-soup-for-the-soul success stories. 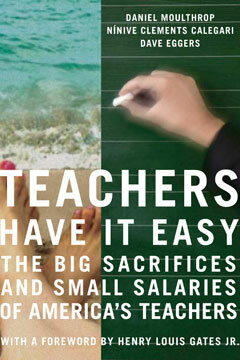 With a look at the problems of recruitment and retention, the myths of short workdays and endless summer vacations, the realities of the work week, and shocking examples of how society views America’s teachers, Teachers Have It Easy explores the best ways to improve public education and transform our schools.